Ice cream’s not just for eating – it can be your face wash too! 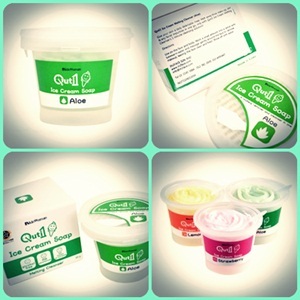 Get the #Quti1 Ice Cream Soap in Aloe from @hishopmy! Clean your face with some ice cream! Now, you can remove your makeup AND cleanse your face with just one step, thanks to the Quti1 Ice Cream Soap! Not only will it gently cleanse and remove thick makeup, this product is also free from alcohol, harmful chemicals and synthetic colours.